The price of a pound of legal marijuana has been plummeting for 18 months, according to a new report tracking the cannabis U.S. spot price index. Analysts at Cannabis Benchmarks, an independent price reporting agency, found the price per pound of legal marijuana was down 13 percent in 2017 compared to 2016, and they’re projecting prices will continue to fall in 2018. The findings were published in the Denver-based firm’s new 2017 Annual Review and Outlook, which examines the U.S. spot index for legal cannabis. Similar to commodities like gold and oil, the independent price reporting agency tracks spot prices — the current value in the marketplace at which an asset can be bought or sold for immediate delivery. 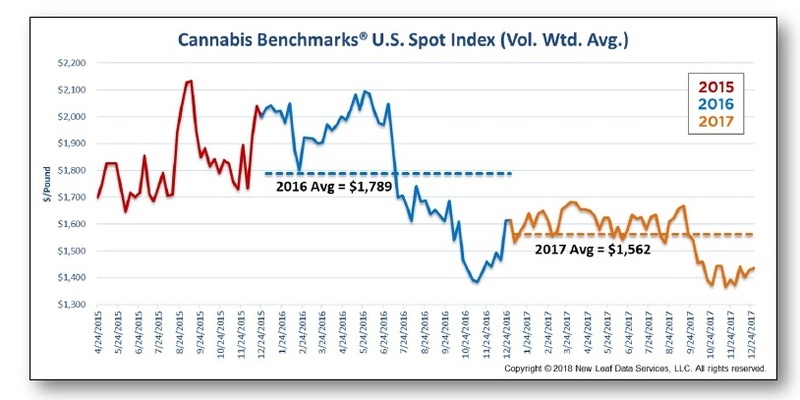 The declines in wholesale cannabis prices realized in 2017 are part of a trend Cannabis Benchmarks has been tracking since the firm first began collecting pricing data in early 2015, said report author Adam Koh. It appears that prices may be reaching their nadir, he said. Since Colorado and Washington launched retail cannabis sales in Jaunary 2014, seven additional states and Washington, D.C. have legalized adult-use marijuana. As cannabis markets expand, Koh said, cannabis prices are showing the same seasonal pressures as other crops. However, pot prices are more susceptible to factors such as natural disasters, politics and varying state regulatory guidelines. At the same time, the 2017 pricing downturn was relatively calm in the more established Colorado and Washington state markets, he said. 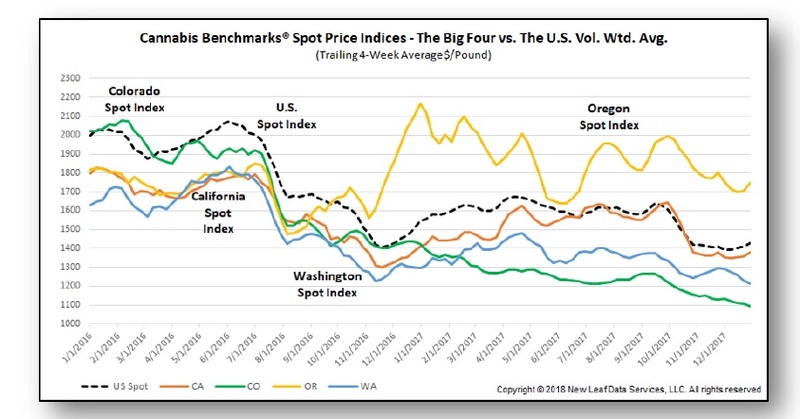 The two most mature state marijuana markets well-supplied, Koh noted, which helps to prevent big price swings. Overproduction and oversupply, however, had a major impact last year in the other two important cannabis markets: California and Oregon. While the deadly and devastating wildfires that swept through California last fall destroyed large swaths of cannabis grows, the Cannabis Benchmarks report found those losses “were not enough to impact supply dynamics statewide, especially in a year that saw bounteous production otherwise.” That bumper crop, especially in northern California’s famed Emerald Triangle, reportedly made 2017 the “the most favorable harvest season in years,” the report said. In Oregon, “too much of a good thing” was a big problem in 2017. The state’s lack of overall limits on production, combined with a relative absence of vertical integration, a good outdoor farming season and more savvy commercial-scale cultivation created headline-grabbing overproduction issues, the report said. That overproduction, in turn, triggered a “steep drop in wholesale prices less than 18 months after the beginning of adult-use sales” in the state, according to the report. Moving deeper into 2018, any number of wild cards could affect national wholesale cannabis prices, Koh said. The wildest among those cards remains California. The Golden State launched adult-use cannabis sales on Jan. 1, instantly becoming the nation’s largest legal marijuana market. However, California’s new cannabis regulations won’t be phased in until July, so growers, dispensaries and the full supply chain are currently operating in a regulatory grace period. All cannabis grown and sold in the state from July onward will have to conform to the stricter rules, which could send ripples through the market, Koh said. July is also when the summer greenhouse harvests come to market in California and elsewhere, “so it will be interesting to see how these two competing pressures balance out,” he said. If all goes as planned, Massachusetts will launch recreational sales in July. While the numbers of cannabis businesses that can start sales in the Bay State will remain quite limited for some time, Koh thinks legal cannabis demand in Massachusetts should eventually become a factor in the larger national wholesale prices picture. Despite concerns over the political climate in Washington, D.C., Koh expects the legal markets and cannabis producers to remain relatively unaffected by federal policy.